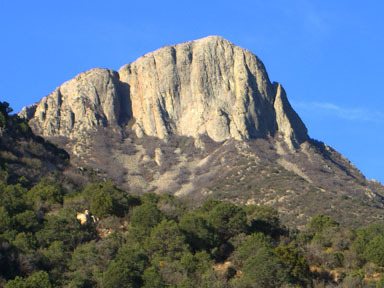 You can see Cookes Peak from both I10 and I25 in southern New Mexico, but this often-viewed peak is seldom climbed. 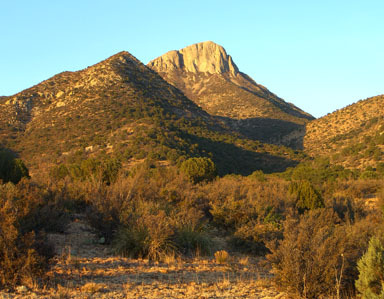 The shapely Cookes is the highest peak in Luna County, a county that borders Mexico, and you can see into Mexico from the summit. 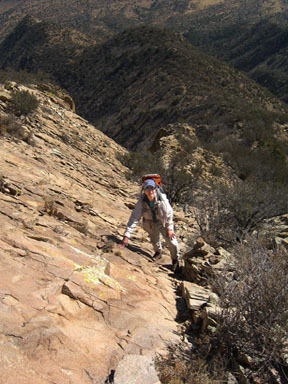 Cookes supports surprisingly steep east and west rock faces, and the peak seems wilder as you approach the summit. 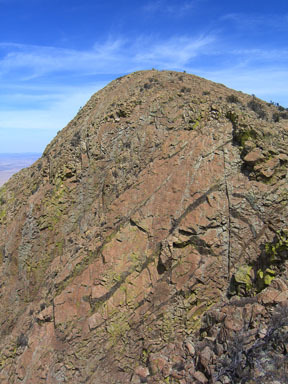 This is the shortest, easiest route up Cookes Peak, and it provides a hike up a gully, a steep ascent to a ridge, and a rocky scamper to a prominent summit. 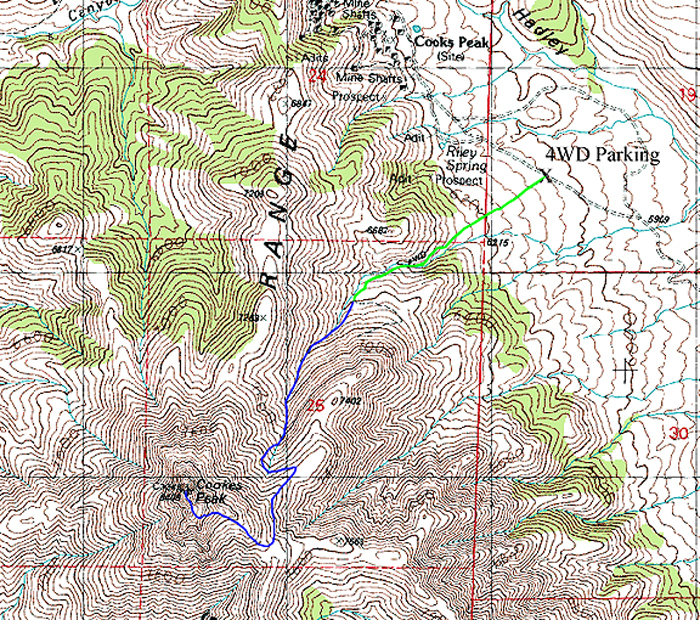 This is a moderate day hike from the 2WD trailhead and a short day hike from the 4WD parking spot. There is a use trail for much of the ascent, but sometimes it fades away. 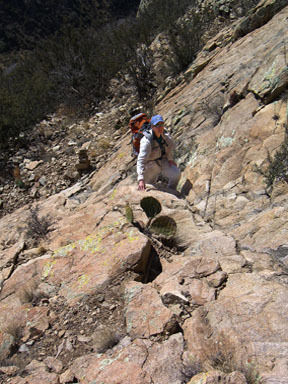 If you lose the route, you may encounter some nasty bushwhacking, but if you stay on the route described here, you can make a speedy ascent. Start at the Cookes East Trailhead at 5,340 feet. With permission, pass through the Hyatt Ranch land, or hike around it to the southwest if you prefer. The BLM has negotiated an easement around this private land; look for orange stakes west of the road. 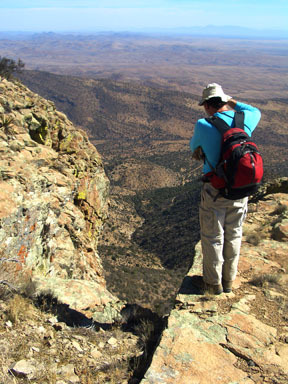 Reach BLM land then go north-northwest up the road to the 4WD parking spot at 6,040 feet. It is 2.2 miles from the locked ranch gate to the 4WD parking spot where a small BLM sign advises that the old road heading toward the peak is not passable to vehicles. Heed this advice. From the 4WD parking spot, you have an unobstructed view of the peak’s imposing east face. The unnamed canyon directly below this face is the beginninng of the route. Leave the security of the approach road and hike southwest directly toward the peak up an old, eroded road. This track is initially on the gully’s north side, goes up the creek bed for 200 yards, then climbs along the creek’s south side. At 6,600 feet, 0.7 mile above the 4WD parking spot, leave the old road when it switchbacks east and climbs away from the creek. 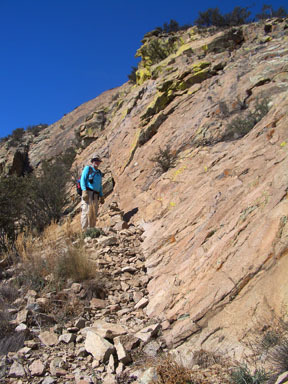 After leaving the road, stay above the creek bed’s rough southwest side for 300 yards, and look sharp for an old trail that contours neatly into the creek bed. Go up the rocky creek bed to a fork in the narrowing gully at 7,200 feet. Take the southwest (left) gully, and within the next 200 yards, climb out of this gully on it’s northwest (right) side. Find and follow a faint use trail that climbs steeply to 7,400 feet, turns southeast above the top of the gully, then switchbacks east to reach a small saddle at 7,540 feet. From here, you will have a view of Cookes’ dramatic east face. 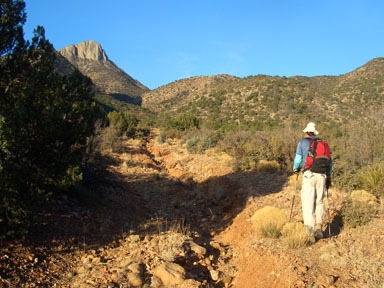 Hike southwest above the 7,540-foot saddle on a good use trail, and follow it south to the vicinity of a 7,740-foot saddle 0.3 mile southeast of the peak. The trail disappears below this saddle, so just head up the hill and find the reemergent trail on the ridge above the saddle. 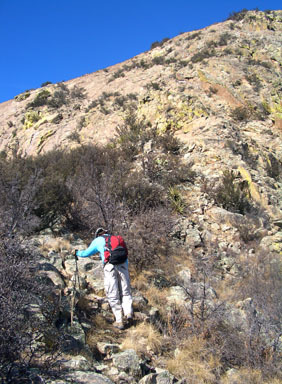 Cross to the southwest (left) side of a fence, follow the trail northwest toward the peak’s upper rocks, and stay below a rough ridge bump on it’s southwest side. 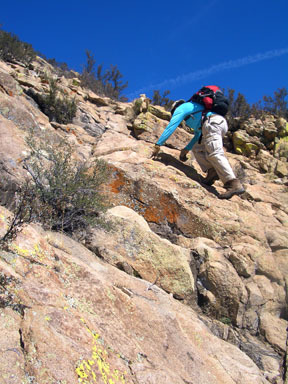 When the trail bumps into the final rock band, traverse 40 yards west (left) to a weakness in the cliff above. Scamper 60 feet up a class 2+ rock pitch to easier terrain. This is the route’s crux. Follow a ramp system up to the west (left) to still easier terrain, then walk 150 yards north to the highest point. Look down on your route. 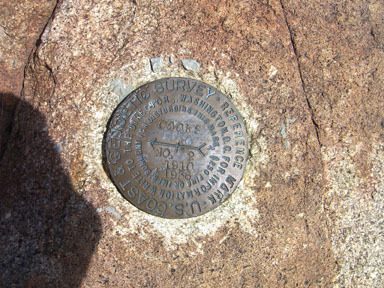 Either going to or descending from the main summit, take the time to visit Cookes’ 8,380-foot southern summit. It is only a few strides west of your direct line, and it offers a refreshing view of the main summit.